Hotel Ideal, Naples. 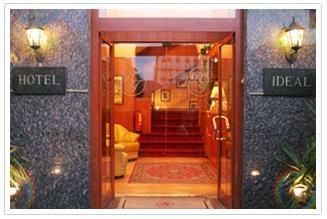 Ideal Hotel Naples. Hotel Ideal is a small and comfortable three star hotel set set in twentieth century building in one of the most characteristic areas of the city. The hotel, set in a strategic location is just 50 meters from the railway station, in few minutes you will run along shopping streets and close to the hotel you will find Plebiscito Square, an important symbol of the majestic monumentality of Naples. Wi-fi service avaiable in the bar area free of charge, live-bar, spacious rooms equipped with the most comfort, rich continental breakfast served every morning from 7.00 a.m. till 10.30 a.m., courtesy and helpfulness, an attentive staff, these are the most important points of Hotel Ideal.